"Before the age of 30, Bertrand Sourdais had already made an impressive name for himself at Spain's Dominio de Atauta. In the process of revealing a new terroir from Atauta's ancient, ungrafted vines, Bertrand learned many invaluable lessons. The most important of these was the need to think critically about every single step in the viticulture and winery work. This process at Atauta also got Bertrand to start questioning the existing orthodoxies in his native Chinon. By 2003, Bertrand determined to return to France and take up the challenge of his beloved Cabernet Franc. His father's estate, Domaine de Pallus, is located in the heart of the appellation and is blessed with some of Chinon's choicest vineyards. With vines averaging over 35 years old, Pallus held all the potential Bertrand could hope for. Beginning with the 2003 harvest, Bertrand has begun his quest to find the ultimate limit for Pallus. 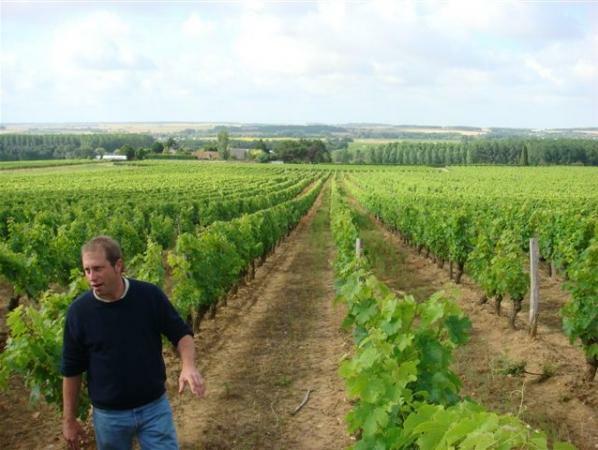 As of 2010, Bertrand is converting the winery and his vineyards fully to biodynamic practices." Wine Spectator 91 "This has good depth, with a richness to the layers of damson plum, black cherry and red currant fruit, accented by notes of bouncy pepper, savory and olive. The finish lets a briar accent hang on. Should mellow with moderate cellaring. Drink now through 2018. 3,500 cases made."